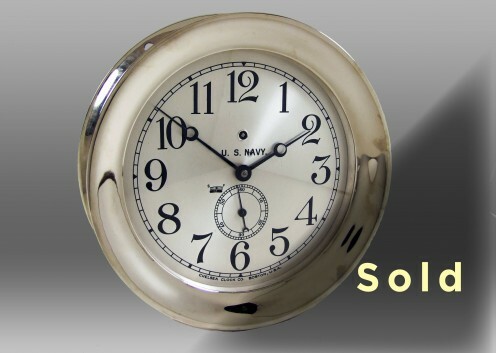 This 8.5” Pilot House Mechanical Clock was originally sold to a U.S. Navy Supply Officer on June 21, 1917. Housed in a forged solid brass case with chrome finish, this impressive timepiece features a hinged bezel, a silvered dial with black Arabic numerals, and black moon hands. The dial is marked with “U.S. Navy,” and the Naval Observatory serial number, 110414, is etched faintly above the winding arbor (Note: The dial has been cleaned but not refinished in order to preserve its original condition). The E-PH movement (time-only mechanism) has been completely overhauled. In addition, new hands have been installed, the case has been cleaned and the bezel glass has been replaced. Serial #110415.